TELLURIDE, COLORADO -- Better make room for an extra crewmember aboard any spaceship heading outward. This person won't require food, oxygen or water, nor even need to buckle up for safety. The tag-along traveler could, however, be a lifesaver in terms of getting the expedition to and from a celestial destination. Roll out the welcome mat for the virtual astronaut and enter the 3D space of Peter Plantec, a consultant in virtual human design and animation, as well as a leading expert on visual entertainment. He also initiated the "Sylvie" project -- the first commercially available virtual human interface. And if dispatching virtual humans from Earth doesn't turn on your thrusters, think about this. It's likely that extraterrestrial civilizations might send surrogate entities our way instead of propelling their delicate, soft-shell selves across interstellar mileage. "In a sense, our space probes are a kind of virtual human," Plantec told SPACE.com after speaking at the 5th Annual Telluride Tech Festival, held here August 13-15. "They are very sophisticated. They have to make decisions on their own...not many, but some. It's a very primitive stage of virtual human technology," he said. Plantec envisions a partnership between in-the-flesh space voyagers and virtual humans. "We humans are fairly limited characters. We are very good at soft responses...but not very good at high-speed, highly complex responses. And that's what virtual humans are really great at. That's their deal," he noted. From a space perspective, not investigating the utility of virtual human technology in the future exploration of space is insane, Plantec said. "It's more than just looking like or acting like a human. It is all the capabilities behind that...the capabilities that can be used to make journeys into space more successful." Most certainly, a humans-to-Mars mission would be very complicated, fully loaded with high-tech gear and festooned with operating manuals, along with scads of on-line documentation. A virtual human could be set up to monitor highly complex systems in real time. It can interface with the human sojourner, easing that person's workload, Plantec advised, by monitoring onboard systems and automatically make whatever critical adjustments it has been authorized to do. "The future of space exploration has to do with filtering the input to the humans, so they don't get overloaded. 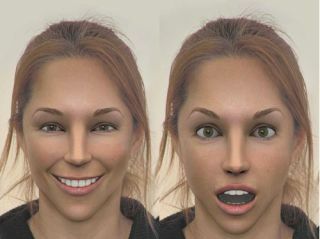 And a virtual human is a great way to do it," Plantec said. Plantec bristles a bit when contrast is made between virtual humans and HAL 9000, that artificially flavored intelligence that audiences ate up like popcorn in the movie classic, 2001: A Space Odyssey. "HAL was a vision of artificial intelligence...and I'm not a big fan of AI. Never have been," Plantec said. "What we really need is to fake conscious behavior so that we humans can have the emotional relationship with machines. You can't do that with AI." At some point, there will be a merging of AI and the faking of consciousness, Plantec added, leading to AI beings that are self-programming entities and able to emulate human consciousness behavior. "And I look forward to that," he said. Today, there are a number of advancements taking place in blending artistry and technology to virtual-human personality design. On-screen faces that humans talk to and interact with come replete with exquisite features, along with nuances of eye and lip movement, not to mention a dash of personality. "It's eerie. You absolutely know that there's somebody inside there. And that's the kind of thing you have to do in order to captivate the technological disenfranchised...the people who are being left behind," Plantec explained. "We want to bridge between the ordinary human and technology. We can do that with the one thing that they really understand...and that's ordinary conversation." Examples of where things are headed have been captured by Plantec in his bestseller on 3D animation: Caligari trueSpace2 Bible, as well as the recently published Virtual Humans -- nothing less than a build-it-yourself resource guide, complete with software and step-by-step instructions for fashioning your own creature of comfort. As virtual humans walk among us, so to speak, one can speculate about future implications. "We humans, I think, are hungry to bond with machines...and I don't understand that at all," Plantec said. "Wouldn't it be interesting if it was a natural instinct that was the next part of our evolution? I really believe that, eventually, these things will evolve into a quasi-life form and we will form symbiotic relationships with them." What about other civilizations distant from Earth, far older than we are -- standing tall on higher rungs of the evolutionary ladder? "Any intelligent species is not going to send out their most fragile, soft life forms to do the hard space exploration. They are going to send out their hardened life forms," Plantec stated. "When you have virtual life forms, you can harden them to almost any circumstance." But what about those space voyagers among you, anxious to fly by the seat of your pants for real? Don't worry, Plantec responded. "There is an element of the human nature that needs to explore. I believe it's genetically breed into us to explore space. It's an inexplicable drive that we have," Plantec said. "There's lots of evidence that it is our destiny to go beyond Earth and explore." Plantec added that being the hands-on creatures we are, it's almost like we wish we could touch and taste atomic energy. Same thing with Quantum theory and a hunger to shrink down and frolic with the physics of it all. "But the one thing we really can do is explore the macrocosm. So we're going to do it...no matter what," Plantec said. Nonetheless, taking along some virtual human companions is essential. "In exploring space, there are a lot of hard decisions that need to be made. We're much better at soft decisions. Virtual humans are much better at looking at the information and making the correct decision for survival," Plantec concluded.